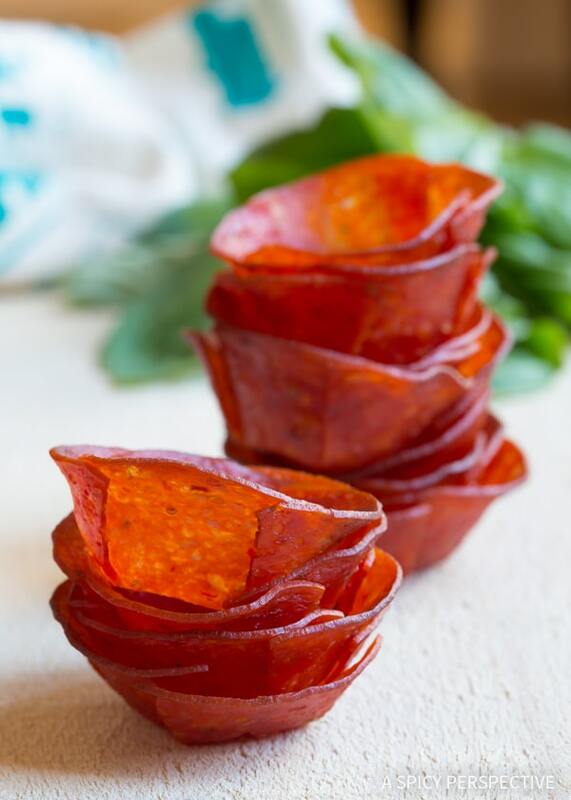 Low Carb Pepperoni Pizza Bites – a fun, easy to make 5-Ingredient party snack to help curb your cravings so you keep your resolution this year. The worst part of any diet is the snacks. I can deal with light low carb breakfasts. I can deal with salad and protein for lunch. 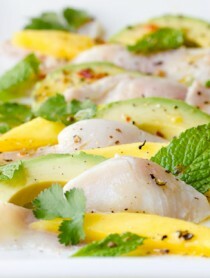 I can even deal with (and often enjoy the challenge of) lean healthy dinners. However, when it comes to quick snacks, carrot sticks and raw almonds get old really fast. 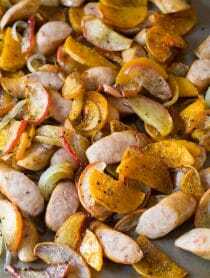 If your new year’s resolution was to cut carbs this year, I’ve got a party snack that will help you stay on the straight and narrow, right on through Super Bowl! 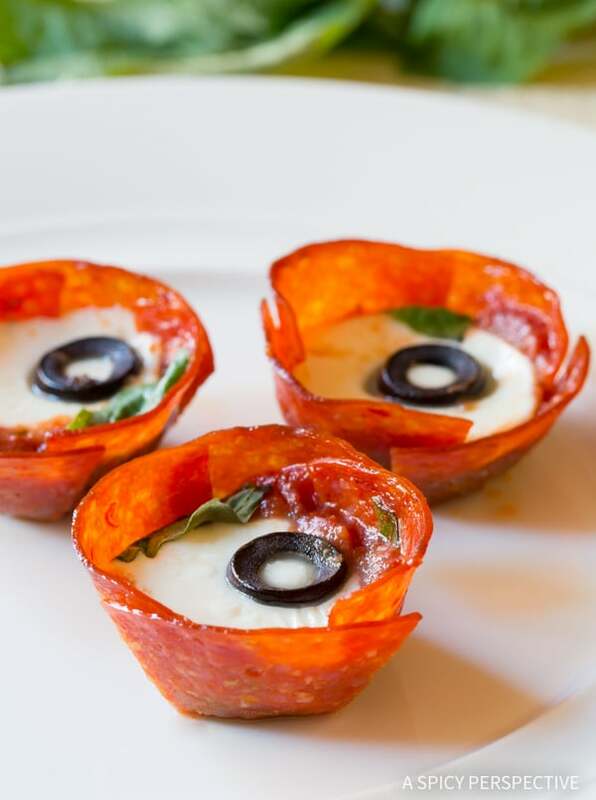 Today’s Low Carb Pepperoni Pizza Bites require only 5 simple ingredients to make and satisfy serious pizza cravings in one bite. 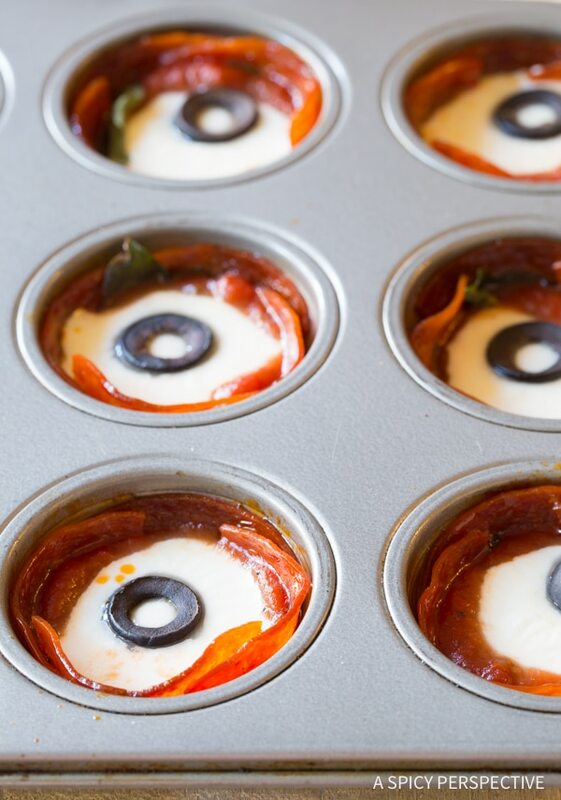 These Pepperoni Pizza Cups are extremely low in carbs and are also gluten-free. 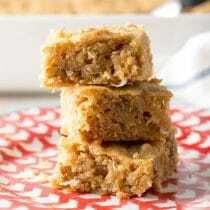 Plus, once the cups are baked, drain them on a paper towel to remove extra fat! You can even make a paleo version by using almond or cashew cheese. How Do You Make Pizza Bites in the Oven? Start with large “sandwich style” pepperoni slices that are at least 2 inches wide. You can find them in the deli section at the grocery store. Bake the pepperoni cups for 5 minutes. Cool for a few minutes in the pan so they firm up. Then move the cups to a paper towel to drain off the grease. The cups can now be stored in the refrigerator for up to a week. Or you can fill them with any filling you like and enjoy right away! 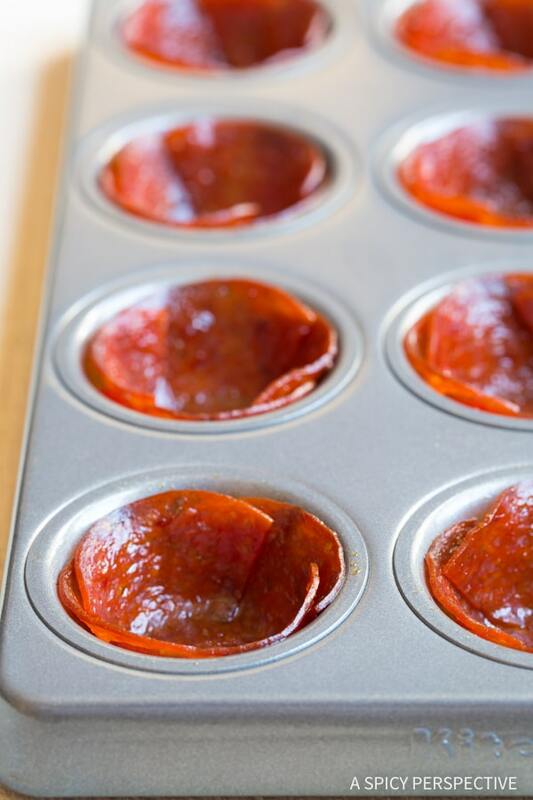 For the Low Carb Pepperoni Pizza Cups, wipe the grease out of the pan and place the cups back in. 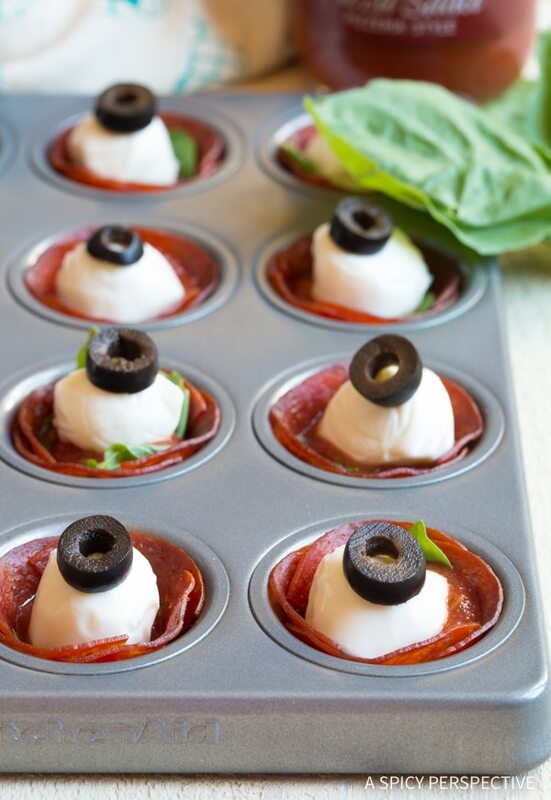 Put a small basil leaf in the bottom of each cup, followed by a little bit of pizza sauce, a mini mozzarella ball, and an olive slice. Bake the cups again for 2-3 minutes to melt the cheese, then dive in! 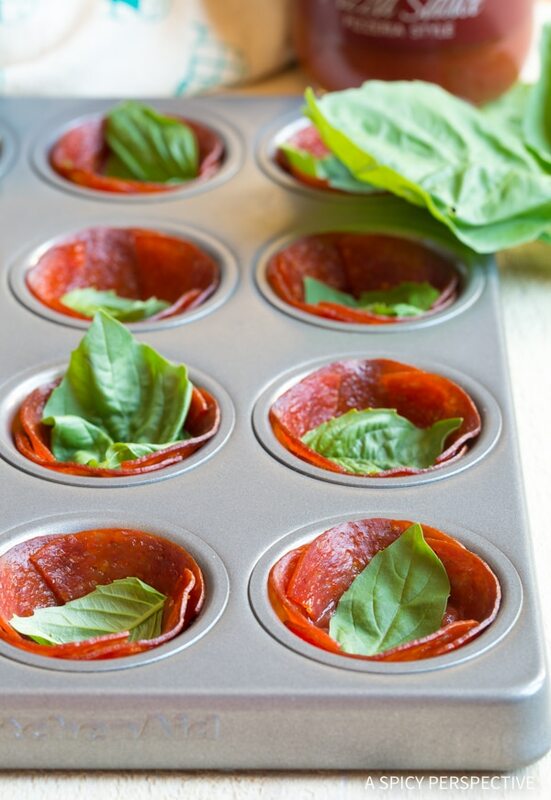 You might be tempted to skip the pre-baking and pepperoni cup cooling, and just add all the ingredients into the cups at the beginning. I encourage you to resist the temptation. 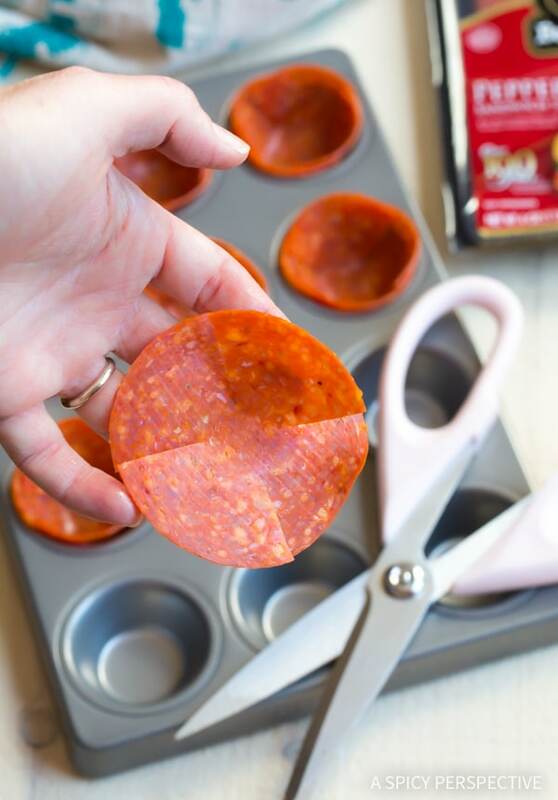 Low Carb Pepperoni Pizza Cups are much crispier and hold their shape better if you prebake the cups before you fill them. However, you can drain the cups at the end to save time. It’s up to you. 5-Ingredient Low Carb Pepperoni Pizza Bites are a life-saver during diet season. Take them to office events, cocktail parties, and of course to your Super Bowl party. They will help you resist the chip bowl all evening long! How Do I Store Pizza Bites? After the first initial bake to make the cups crispy you can store them in the refrigerator for up to a week and make them as you need/want them. Or you can fill them with any filling you like and enjoy right away! Can I Substitute Out the Basil? Absolutely! Use any fresh herbs you like, or just omit the basil altogether. Let me know how your customizations turn out in the comments below! See The Recipe Card Below For How To Make Low Carb Pepperoni Pizza Bites. Enjoy! Low Carb Pepperoni Pizza Bites - a fun, easy to make 5-Ingredient party snack to help curb your cravings so you keep your resolution this year. 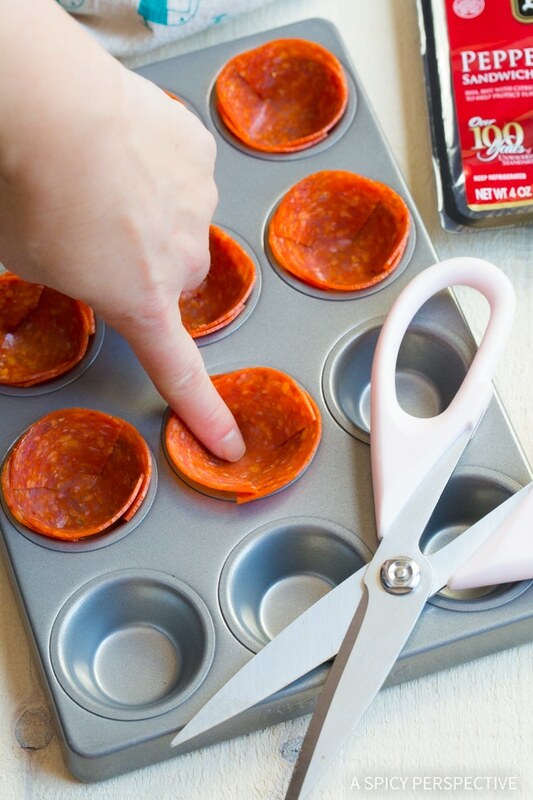 Press each pepperoni down into a mini muffin pan. Bake for 5-6 minutes, until the edges are crispy, but the pepperoni is still red. Let the pepperoni cool in the pans for 5 minutes to crisp, so they hold their shape. Then move the cups to a paper towel lined plate to remove excess oil. Wipe the grease out of the muffin pan with a paper towel, then return the cups to the pan. 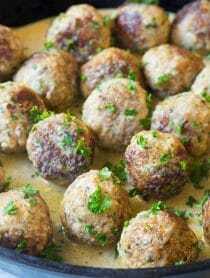 Place a small basil leaf in the bottom of each cup, followed by 1/2 teaspoon of pizza sauce, a mini mozzarella ball, and an olive slice. Place back in the oven for 2-3 minutes, until the cheese starts to melt. Allow the cups to cool again for 3-5 minutes before serving. 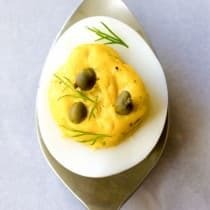 Paleo Adaptation: Make a paleo friendly version using almond or cashew cheese instead of the mozzarella balls. 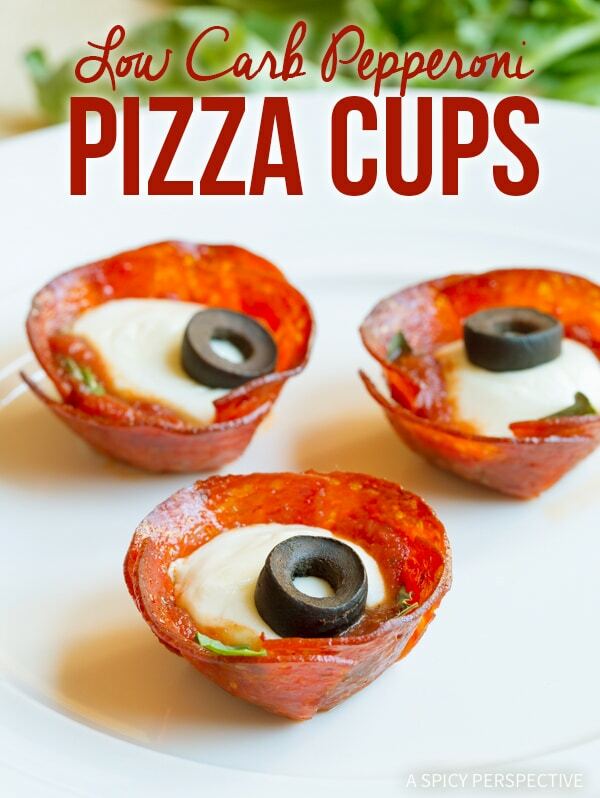 Can I use the smaller Pepperoni and form it around the cup? It’s definitely worth giving it a try. Let me know how it turns out! Can you sub ham for the pepperoni ? Oh yummy. I used the regular sized cupcake pan and they ended up flatter. Delicious … we made all different combination with Italian sausage, onions, mushrooms. All delicious. Also paired with a salad. Yummy & fun! Paired it with a salad. The kids loved them as well! These are delicious! Even cold! I just made this! I did not have a mini muffin pan so I took 3 pepperoni and cut them as instructed so they could fill the regular size muffin pan. I followed every thing else and they came out perfect. Of course I will have to adjust nutritional values but they were delicious!!! Whats the best way to keep these? Can they be frozen or refrigerated?? I am wondering about the nutritional information.The serving size says 24 cups. Is it 48 Calories for all 24 cups or is it 48 calories per cup? Can u sub for the basil? 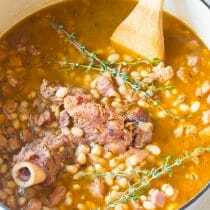 Easy, fun and so good ! Subbed salami for pepperoni and worked out great. This looks so simple and delicious! Do you think this recipe could work in the microwave? I’d love to make this in my dorm room. What is the macro (protein/fat/carb) breakdown for these? 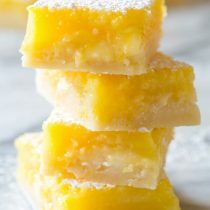 I made them yesterday and they were delicious and am currently doing Keto diet and need to know for tracking, thanks! Just made these! Awesome! I suggest leaving the completed snacks in the muffin tin for five minutes, not two or three. I had better luck with them holding their shape. Great flavor, thanks for the recipe! Oh my gosh, I can’t wait to try these!! This is a perfect solution for my son’s birthday that is getting closer. I would maybe use the mild version of salami slices. Great! Thank you !